A Slick And Elegant Computer Work Station Will Be A Great Addition To Your Home or Office. This 48 In. Station Features Fiberboard Shelves With CD Storage Section. Easy to Read Instructions Will Make Your Life Much Easier To Deal With This Station. Strong Construction. Easy To Assemble. Available In Blonde Maple And Espresso Color. Dimension: L. 47.75 In x W. 23.75 In. x H. 59 In. Computer Desk. Easy to Assemble. Strong Construction. 4 Top Shelves With Glass Doors. Oak Color. Dimensions: 35.4 X 23.5 X 70H.. Basic Glass and Metal Desk is only available in Silver. Size: 47.2 In. (W). x 23.6 In. (D) x 43.3 In. (H). This Glass Top Space Saver Desk is as Stylish as it is Functional. Featuring a Frosted Glass Top, CPU Shelf and Two open Storage Shelves all in Nickel Finish. 47-1/4 In. (L). x 23-5/8 In. (W). x 31-1/8 In. (H). Simple Desk is only available in Silver. Easy to assemble. Size: 47.2 In. (W). x 23.6 In. (D) x 43.3 In. (H). This Elegant Computer Desk Model Is An L-Shape Style Provided With Frosted Glass Top With Enough Space To Place Your Keyboard, Printer, Fax Machine And Other Office Accesories. It Also Has A Frosted Glass Shelf For The Monitor And A CPU Holder. It Is A Beautiful Model That Suits Any Working Area With A Modern And Elegant Touch. Dimensions: 59 X 59 X 38. *Local Delivery Or Store Pick Up Only. Computer Desk. Beautiful Design With Keyboard Tray, CPU Compartment, And Glass Shelf For The Printer. Also Includes Shelves For Books Or Other Office Accesories. Size: 48W. x 24D. x 72H.. Easy To Assemble. This Computer Desk Was Created To Fit The Customer Who Will Not Settle For Any Ordinary Office. Straight Series- For People Who Like To View Their Monitor In A Normal Position. Steel Frames- Offers Scratch Resistance & Static Free. Metal Inserts- Offers The Ability To Rebuild Your Desk. Smooth Round Edges- Free From Personal Injury. Tinted Tempered Glass- Offers Durability And Scratch Resistance, Much More Than Regular Glass; Break Resistant Slide Out Keyboard Shelf- Easily Hides Away When Not In Use. Left & Right CD Racks- Extra Space To Store Your Music, Computer Programs Etc. CPU Shelf- Offers The Ability To Place The CPU On Either Side Of Desk. Printer/Scanner Shelf- Easy Access To Documents. Monitor Shelf- Space Saver. Easy To Assemble. Dimensions: Depth: 41.7 x Width: 60.6 x Height: 50.7. Compudesk Computer Desk (MO). Includes Dedicated Storage for Vertical CPU Tower, Metal Runners with Safety Stops and CD Rack Holds 28 CDS. Size 18In x 26In x 50InH. Computer Desk With Shelves. Includes Keyboard Space, Shelves And CD Racks. Strong Construction. Easy To Assemble. Contemporary Styling Computer Desk With Sliding Keyboard Tray, and Chrome Tubing. Also Available (Not Included In The Price) Matching Chrome Chair Wrapped in Leather and File Cabinet In Black With White Stitching. Easy To Assemble. Details: Desk: 48 In. (L) x 28 In. (W) x 29 1/4 In. (H)..Chair: 21 1/2 In. (L) x 22 In. (W) x 31 1/8 In. (H)..And File Cabinet: 15 3/4 In. (L) x 19 7/8 In. (W) x 24 3/4 In. (H). Corner Computer Desk In Black Finish With Glass Inserts. Strong Construction. Easy To Assemble. Size: 48 In. (L) x 48 In. (W) x 35 In. (H). *Local Delivery Or Store Pick Up Only. Click Here For Delivery Areas. Glass Top And Metal Computer Desk With Pull Out Glass Keyboard Tray. Easy To Assemble. br>Size: 49 In. (L) x 27 1/2 In. (W) x 30 In. (H). *Local Delivery Or Store Pick Up Only. Click Here For Delivery Areas. An Upbeat, Cool Look ThatÃs Not Just For School Anymore. Desk Has A Pull-Out Keyboard Tray, Locking Casters For Mobility, And Three Full-Extension Drawers Big Enough For All Your Students Needs. Made From Industrial Strength Powder Coated Square Tube, Barstock And Sheet Steel In A Silver Finish With Inset Laminated Top Panel. Includes Changeable Navy, Red, Dark Sage, Orange And White Drawer Front Panels. Strong Construction. Some Assembly Required.Also Available (Not Included In Price) White Desk Chair. Chrome Plated Chair Swivels, Reclines And Has A White PVC Seat And Back For Long Lasting Durability. On Five Casters For Easy Mobility. Strong Construction. Some Assembly Required.Dimensions: 52 In. x 21 In. x 30-1/4 In. (H)Desk Chair: 21 In. x 22-3/4 In. x 35-38 In. (H)Seat Height: 16 In.-19 In. (H) Matching Items Available. See Related Items Below. Oak Finish Computer desk With Bookcase. Easy To Assemble. Dimensions: 40L. X 29W. 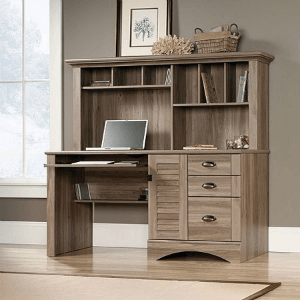 X 59H..
Executive Oak Finish Computer Desk With Bookcase And Sliding Keyboard Tray. Easy To Assemble. Dimensions: 60L. X 87W. X 62H. Oak Finish Computer Desk With Sliding Keyboard Tray And Tower Stand. Easy To Assemble. Dimensions: 42-1/2L. X 24W. X 35-1/2H.. Contemporary Design Computer Desk In Frosted Glass Top And Natural Finish With Unique Floating Glass Top And Frosted Glass Doors. Easy Mobility With Eight Casters, Pull Out Keyboard Tray And Two Doors Storage. Size: 49 3/4 In. (L) x 23 3/4 In. (W) x 31 1/8 In. (H). *Local Delivery Or Store Pick Up Only. Click Here For Delivery Areas.